My 16 year old son recently chipped his two front teeth when he went over the handle bars of his mountain bike. Our dentist fixed them by “bonding” some filling material to them. She said they might not last forever, but they look great — can you tell me more about them? Your dentist placed “composite resin” restorations on your son's teeth to replace the missing tooth structure. These tooth-colored fillings are a mixture (a “composite”) of a plastic-based matrix with inorganic glass filler. A “coupling” or joining agent is used to enhance the bond between the two components. The glass filler gives the composite resin wear resistance and translucency for both strength and esthetics. The ratio of plastic matrix to glass filler in the composite resins can vary depending on the circumstance it's to be used for; biting areas will require more filler for strength, esthetic areas less. And, there are multiple types and brands. Composites can be made in a wide range of tooth colors allowing for near perfect color matching with existing teeth — in artistic hands they can be made to look very natural and lifelike. Composite resins can be bonded to most healthy tooth structure. They are joined or bonded to the teeth mechanically through microscopic “undercuts” (or locks) in the natural tooth substance that allow the tooth enamel and composite resin to function and look like one piece. Direct composite materials have superior advantages to traditional materials like amalgam (silver filling): improved appearance, a more conservative preparation and greater use of the existing tooth to support the restoration. Composites can be made in a wide range of tooth colors allowing for near perfect color matching with existing teeth — in artistic hands they can be made to look very natural and lifelike. Composites can be placed quite quickly and easily, and are relatively inexpensive. They require very little tooth preparation (drilling) of the healthy tooth structure since they can be bonded directly to the tooth. Example 1: The patient had a chipped front tooth that is repaired beautifully with the use of a composite restoration or most commonly referred to as a bonded restoration. Example 2: This patient had two chipped front teeth which is a more difficult restorative problem providing an excellent example of how a beautiful cosmetic result can be obtained with bonded restorations. Example 3: This example illustrates how composite restorations can close spaces between teeth as well as repair the exposed root of the tooth. However, there are some disadvantages. The more tooth structure lost through injury or decay, the less effective they become because the material itself is not as strong as the tooth structure it replaces. Consequently, a large bulk of composite resin may not stand up to biting force over time. The composite can also stain and dull as it ages. However, it's a good interim material until a patient can receive a porcelain restoration, which could be a better long-term material selection. Composite resins are also an ideal material choice for teens like your son because their dental arches (the upper and lower jaws) are still developing. The pulp chambers containing the nerves of his teeth are still probably quite large. By placing more permanent restorations like porcelain veneers or crowns that require more tooth structure removal, the long term health of his teeth might be compromised. 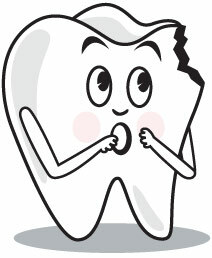 After his teeth have fully developed, though, you might consider the more permanent restoration. One other bit of advice from a dental professional: you might consider a custom mouthguard to protect his teeth from a similar injury as long as he's participating in high risk sports — ask your dentist.